What do we have here? 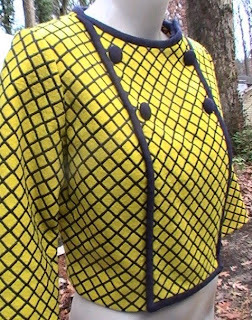 Why, it's a cropped jacket with 3/4 sleeves from around the 1950s or 60s in bright, cheery yellow, and it appears to be made of wool and satin. Surely this fabulous spring topper must be way out of my price range. It must be listed for at least $60 that I cannot separate with this month. What? It's only $20 from Mod Marge Fine Finds on Etsy? What a steal!